The personal plug-in heater. Add warmth and comfort anywhere! 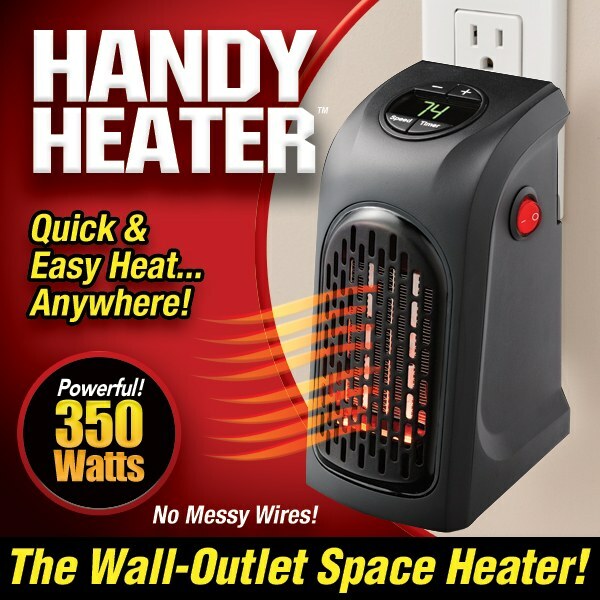 Handy Heater plugs right into any outlet without taking up any space to give you a warm and cozy place to relax! It&apos;s the quick, easy way to heat up to 250 square feet without expensive heating bills. Wife loves it, bought two more after this one. 74 people found this helpful. Was this review helpful? This little heater is just what I needed in my basement. I can plug it in over the counter so the kids can&apos;t reach it while they are playing down there and it adds some warmth. Also great for a cold bathroom! 71 people found this helpful. Was this review helpful? 51 people found this helpful. Was this review helpful? 47 people found this helpful. Was this review helpful? Small, compact, easy to use, cuts off automatically so a fire won&apos;t start. WORKS GREAT IN BATH ROOM. It doesn&apos;t help warm the room I am in. Heat just stay near the heater. Doesn&apos;t blow the heat into the room. Either it is a lemon or that is what it does. I would like to return it. the item gets very hot. Not good for a household with children. It doesn&apos;t heat up the room enough, even at the highest temperature. Love it. It heats up my kitchen and my laundry room gets warm also. Great product. Perhaps I am expecting it to heat faster or to a bit larger area, but this little heater - while it is certainly handy - just does not help alleviate the cold air in even a small area quickly enough for it to be much help. Perhaps if I could be up an hour early to turn it on near the counter where I sit for breakfast, it would produce a little pocket of heat to make the air comfortable; however, I cannot. I really cannot give a big endorsement for this product. Only heats within about one inch of heater. Heater works fine and happy with it. Give it a 4 1/2 star. This little heater heats up really fast and made my bathroom nice and warm. I haven&apos;t tried using it when the dryer is on, but am hoping that it won&apos;t blow the circuit like a small heater I had did. I really like this a lot! Be sure to read the directions carefully. The heater works so well I have a difficult time keeping it in my area. Everyone in the family loves it. Works great in my bathroom! It was ok, but not nearly as nice as I hoped. It heats a very small area ( my very small bathroom) fairly well, but not a large area as advertised. the heater was very poor. crap! Wouldn&apos;t heat up a shoebox! This heater works well in my bathroom, I don&apos;t think it would work well in a larger room, but it&apos;s great for the bathroom!! Use it in a bathroom that does not get enough heat. Love it..
Really only works in a limited area. you need to be right next to it for it to do any good. I just put it back in the box! Good for under a desk or for a room and not having to do the whole house. Didn&apos;t seem to heat up as much as advertised. The room we were trying to warm up, even though we sat close to the heater, didn&apos;t do a good job. It was very quiet however. It does heat and is easy to use, but it could use a stronger fan. Thank you. It has been great. I highly recommend it. It really does heat up an entire room! Works great,i use it in my bedroom when i dont need to heat the whole house when its just chilly,I love it!!! Great product , worked nicely as described . I live in FL. So for those chili nights this is perfect. I purchased two of these, one for each bathroom and love them. Great little heater. Put it under desk and it takes that chilly air out of the room near the floor. Nice product. Worked so well, went back and ordered another one. you cannot set the heat. the dial is only low or high. Okay in a 8 x 10 room to maintain current temperature if outside temperature not too cold. Otherwise probably more useful for a smaller sized area. This does NOT provide sufficient heat for even a small room. I have put it in my bathroom in hopes of being able to warm it enough to be able to be comfortable taking a shower. It does not do so! Love it . Works great!